4) Writing, ghostwriting and editing self-improvement books – I’ve worked with several authors, the best known is Jack Sc hwarz, one of the foremost authorities in the human potential movement, now deceased. 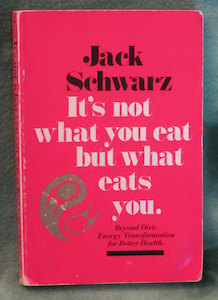 I ghostwrote Jack’s book titled “It’s Not What You Eat, But What Eats You.”My experiences also give me insight into business. As GM of a natural products company, our company was considered to have among the industry’s best marketing programs. It was based on customer education and excellent industry relationships. Sales more than tripled in less than four years; profits increased substantially. I invite you to contact me about what you need to build a better relationship with your customers and clients. I am also an award-winning writer for comedy, so I can be a lot of fun to work with!